As I began to respond, I realized a reply in a comment box was not adequate. So, I will invite my commenter to this new article, just for her. Purgatory is a matter of justice as it is explained in Scripture. Protestants believe a person of faith goes straight to heaven because he is saved. You are either saved or not. According to them, sins are no impediment to heaven because Jesus covers our soul with His precious blood and makes it acceptable for heaven. Catholics believe we are responsible for the state of our own soul, and we must repent of our sins. The only time the Bible mentions covering sins refers to one man forgiving another. Between us, we can overlook sins, but only God can forgive them. I’ve been to non-Catholic funerals where speakers convey their assurance that the deceased has reached heaven. “We know he is in heaven with god right now, and you can have this assurance too,” were the words of one minister at a funeral service. Since Catholics believe that those in the state of grace but who have not made reparation for venial sins, are not pure enough to enter heaven, we pray for our dead--just in case. 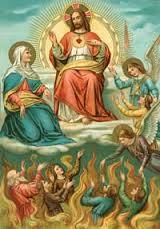 Catholics pray for the souls in purgatory to help speed their way to heaven. Since the writings on the catacombs (tombs of the very early Christians) give evidence that the dead were being prayed for by their Christian friends, we have historical confirmation for our beliefs and practices of today. The Old Testament book of Maccabees contains reference to the Jews praying for souls after their dead. We can cite the same Scripture from which Jesus read and taught to defend our practice of praying for the souls in purgatory: “It is therefore a holy and wholesome thought to pray for the dead, that they may be loosed from sins” (2 Mach. 12:46). Maccabees is one of the Old Testament books removed from the Protestant Bible, even though it was part of the Scripture used by Jews during the time Jesus walked the earth. The book of Maccabees has always been a part of the Bible accepted by the Catholic Church as divinely inspired. Even without agreeing whether Maccabees belongs in the Bible or not, the book gives historical evidence that this was a practice among the Hebrew people during the second century B.C. and is still done among Jews today. Since Protestants do not have the book of Maccabees in their Bible, I will use some books we share in common. “Whoever speaks against the Holy Spirit will not be forgiven either in this age or in the age to come” (Matt 12:32). This statement of Jesus refers to forgiveness in this age and forgiveness in the age to come. There are two different times of forgiveness given in His statement. “May the Lord grant him to find mercy from the Lord on that day” (2 Tim. 1:18). St. Paul is praying for his departed friend, Onesiphorus. “You will never get out till you have paid the last penny” (Matt. 5:26). “Though he himself will be saved, but only as through fire” (1 Cor. 3:15). The above two passages support the existence of purgatory, a place of purification, where we are purged from our sins, where we pay our debt--every last penny. “For Christ also suffered for sins once, the righteous for the sake of the unrighteous, that he might lead you to God. Put to death in the flesh, he was brought to life in the spirit. In it he also went to preach to the spirits in prison, who had once been disobedient while God patiently waited in the days of Noah during the building of the ark, in which a few persons, eight in all were saved through water” (1 Pet. 3:18-20). “For this is why the gospel was preached even to the dead that, though condemned in the flesh in human estimation, they might live in the spirit in the estimation of God” (1 Pet. 4:6). “But nothing unclean will enter it, nor anyone who does abominable things or tells lies” (Rev. 21:27). Our family often prays for the souls of departed Protestants we have known. Sometimes we were just barely acquainted with them, but we realize that it is possible they are in purgatory with no one to pray for them. It’s a great way to show love for our neighbor.